Ms. Kakaee said women’s rights in Iran were negatively affected after the disputed presidential elections in 2009, and that, with threats of persecution and jail, some activists left the country, while others were put in prison. Despite this, Ms. Kakaee said, activists continue their work, although at a much more limited level. She explained how poverty, to which sanctions are a major contributor, increases incidences of violence, particularly against women and children, and pushes back social gains. Maureen Quinn: I want to welcome Parisa Kakaee, women and children’s rights activist from Iran, to the Global Observatory. Parisa was a participant in the International Civil Society Action Network’s first regional forum on women’s rights, peace, and security for the Middle East, North Africa, and South Asia, held in Istanbul in September 2012. Parisa is here today at the International Peace Institute to participate in a panel where we are going to discuss the results from the forum. Women were actively involved in the Green Movement that emerged around the 2009 presidential elections in Iran. What are those women doing today to have their voices heard? 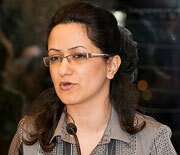 Parisa Kakaee: At first I would like to give you a background on the situation of women’s movement in Iran. Before 2005 and the election of Mahmoud Ahmadinejad, which marked the start of a conservative era, Iranian activists had more opportunities to work on national, social, and political issues. So we had more chances to work on these issues, and we had more chances to write about women’s rights issues. There was some progress on raising social awareness about women’s rights, but after 2005, everything changed, and the chance to work on social and political issues was significantly reduced. Surprisingly, this was also the time that the women’s movement became more active, and most of these activities were a result of open space it experienced during the reform period. But some of it was in resistance to security pressures and the closing of social space. In this difficult situation, all the groups in the women’s movement tried to find a way to work and establish relations with the society. Many activists faced threats of persecution and jail. Some of them were arrested, but they continued with their programs and managed to raise awareness about gender issues in the society. After 2009 and the disputed presidential elections in Iran, everything got worse, such as the situation of activists in society. Some activists left the country, and some others are in prison. Now Iran is facing a very complicated and difficult situation. The society is oppressed by both the domestic government and the international community. But even in this situation, activists are trying to do their best. For example, to increase the awareness of society about violence, they wore make-up to look like they were battered and went to the streets and used the opportunity to speak with people about violence [against women]. Or to protest over some governmental legislation against women, they wrote petitions and collected signatures, and went to Parliament to speak to MPs. All of these activities have been done in an insecure atmosphere in which they may be arrested and sentenced to prison for a long time. But they continue with their work even at a much more limited level. MQ: Sanctions have been imposed and tightened over the last few years by the international community in response to concerns regarding the Iranian nuclear program. What can you tell us about the impact of the sanctions on women? PK: Actually, these days, we’ve face more problems regarding the women’s situation. Some of them are old and the others are new and caused by the complicated economic and political situation of Iran. Existing news and activist reports show the increase of child marriages, unemployed women, unequal wages, prostitution, discriminatory laws against women, and restrictions of personal freedom, education, and also economic problems. Also, since there are not sufficient statistics, we don’t know how many girls are trapped by human trafficking networks and how many are engaged in different types of sexual exploitation of children. To make matters worse, Iran is faced with increasing isolation as a result of sanctions. This means that the Iranian people and civil society also are under pressure. In addition to poor economic policies and economic mismanagement, the main factor which complicates the situation of Iran are sanctions. In fact, the policy of this affects all people and civil society. To explain the situation, I discuss some of these effects. First of all, people are more engaged in fulfilling their basic needs. They are depressed and scared. In the society which people are scared of poverty, the standards of personal morality decline and violence increase. The question is, who are the main victims of violence in the society? As statistics and international experience indicate, women and children are the main victims. So sanctions cause insecurity for women in the society. Second, this violence is not just in the society. Domestic violence is another problem which is caused by sanctions. Sanctions make the economic situation worse. When the percentage of unemployment increases, women get fired from their work, or they have to accept minimum wage. In the male-dominated culture of Iranian society, this is the best opportunity to keep women at home, as mother or wife, and finally to exclude them from the society. On the other hand, the percentage of unemployed men increases, too. So, the economic pressure makes people angry and they should deal with this problem inside the family, which is not possible, and so this leads to violence, divorce, and violent crimes at times committed against women. Third, in complicated economic situations, people are not able to afford their children’s education expense. Sometimes, they have to decide which child should go to school and which one should stay at home. Usually, they chose girls to stay at home, help parents, raise other children, and do domestic work. Also, girls may be forced to marry older men for the financial benefit of the family. So, what I am trying to say here is that this poverty, to which sanctions is a major contributor, can have a profound impact on the situation of women in Iran, and will end in pushing back their social gains. MQ: What would you suggest the international community do to support your work on women and children’s rights in Iran? PK: We have some women’s rights activist who came out of the country for education and plan to go back when their studies are complete. I think the international community should provide them the opportunity to learn about civil society and improve their skills. There should be some programs targeting them. At present, Iran is isolated, and everyone just says we cannot work with this country, or they work with groups inside Iran who will be strengthened but will never ever work for positive change and for women’s rights. So these activists outside of Iran will go back and work for positive change, or even if they are outside, they will work for women’s rights. So this is a way to strengthen the civil society. Also, I know lots of activists who want to continue their education abroad, but they cannot. In fact, because of the situation with the Iranian government and sanctions, the international community restricts the possible opportunities for education and punishes people, especially young people, who can change the future of the country. I think we need to exchange our experience and help people inside of Iran to communicate with the international community. MQ: Thank you very much, Parisa, for joining us today on the Global Observatory.